The Galveston Historical Foundation has announced that Melodey Hauch and Floyd “Lanny” Martin have been selected to receive a 2014 Sally Wallace Preservation Award for their community service with regard to the Magnolia Cemetery project. The selection jury convened in July to review all of the submitted nominations and chose Melodey and Lanny to receive a 2014 Preservation Award. 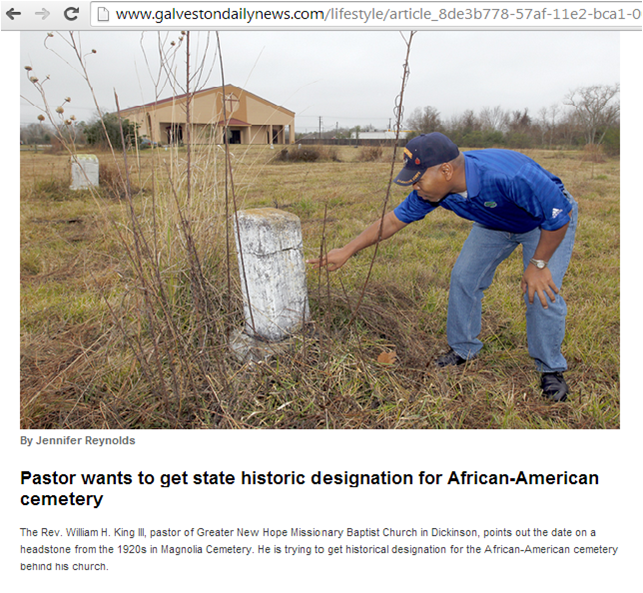 Melodey and Lanny partnered with Pastor William Henry King III of the Greater New Hope Missionary Baptist Church to preserve and record the graves in the Magnolia Cemetery. Magnolia Cemetery is located in League City, Galveston County, Texas on the border of League City and Dickinson. The entrance is reached by turning off of State Highway 3 onto 18th Street in Dickinson which is the border between the two cities. Most of the burials were of Dickinson residents. Historically, the cemetery was known as the Dickinson Colored Cemetery and that name is found in numerous obituaries and death certificates. The online Find a Grave page for Magnolia Cemetery currently includes 556 graves. A group of five volunteers including Melodey and Lanny surveyed the cemetery during 2006; taking photos of the headstones dated 1905 to 2005 and created a computer file with 126 names and dates taken from the headstones. They noticed a number of obvious graves, many covered with concrete slabs that had no inscriptions. Melodey and Lanny visited Mainland Funeral Home in La Marque, Texas and were able to find the names of additional people who were buried in the cemetery in unmarked graves. Lanny has scoured the Texas Death Certificate Databases on FamilySearch.org and Ancestry.com and the Galveston Daily News obituary pages to find records on dozens of unmarked graves. Melodey and Lanny have written a book that captures the story of the preservation effort. The 2014 Sally Wallace Preservation Awards will be presented at a reception on Saturday, August 23, from 4 pm- 6pm, at the 1861 Custom House (502 20th Street). Admission is $15 per person or $100 for a reserved table for eight (8). The reception will include a short program, light hors d’oeuvres, beer and wine. We hope that you will plan to attend the ceremony, and help us celebrate historic preservation efforts in Galveston County. Please call the GHF offices for more information or to make reservations to the 2014 Sally Wallace Preservation Awards ceremony and reception. GHF offices are at the 1940 Sears Building, 2228 Broadway, Galveston, TX 77550 and their phone number is 409.750.9108.